winning situation at the right time - every time? What if you could lay into a streak that's just starting, and before it eventually ends - you're on to the next solid streak? To be able to ride streak after streak while minimizing the risk of being too late, too early, or worse...on the wrong capper altogether? An individual trying to monitor handicappers making those streaks, and when they'll start and end would be a monumental, if not impossible task. Everyone wants to win. That's a given right? The trick is, to go on one of those winning streaks everyone talks about. Everyone wants to win. That's a given right? The trick is, to go on one of those winning streaks everyone talks about - and keep it going for as long as you can - winning as much cash as possible. But such things are not meant to last. Streaks never do. If they did there wouldn't be so many different handicappers out there trying to make the best selections they can with the information they have. But, here's the facts: while some cappers will go on streaks and earn thousands - none of them can maintain that kind of pace. I'm sure I don't have to tell you that streaks come and go - and you either luck out and hit onto a capper who's scoring big on one, or you miss it altogether. And really, for the average player it's no more than luck at any given time if you can peg that capper who is on the cusp of a prolonged streak. Ready to start winning... consistently? Check out today's deals! Finding the earmarks of consistent streaks. For the past eight and a half years we've been focused on just that kind of system. We've followed everyone - from the small time YouTube handicapper to the big services. What we were looking for was the answer to one question: when streaks happen to any given handicapper, are there earmarks that can be measured that say a streak is assured? And of equal importance, when a streak will end? Let’s be real though - from the smallest hobby handicapper to the services? They're all running about 50/50 on wins. But is there a way to look across the win / loss landscape and scrape the cream off the top? After many fails and a lot of money lost - we got our answer. A resounding yes. After looking at countless handicappers for years on end, and trying every algorithm and spreadsheet analysis (all of which failed miserably) we finally developed a specific set of parameters that absolutely shows us when winning streaks are imminent - and more importantly, when to get out. Visit our store and Check out today's deals! One aspect of this system is identifying the handicappers who are on top of their game. Seems easy enough right? At face value sure, but what we're getting at here is the guys who are not only picking winners, but are really coming through with the game specifics - who have those momentary moments of clarity that result in high quality picks. That's what it's really about. It's not completely about winning or losing. How many times have you seen a well called game right down to the specifics - only to have that last minute Hail Mary at the buzzer take the win? It lost, sure. But it's still a quality selection. You just can't predict those on the fly flukes. But how accurate was the rest of the game prediction? These are facts that aren't really collected in this field, as all anyone really cares about is win / loss percentages. What was the quality of the pick to start with? What was the nature of the loss - if there was one on a quality pick? When you see high quality picks lose by these impossible to predict upsets - you realize that a loss is the anomaly - not the win. We're not interested in cappers who just put out the pick and nothing else. We're looking at the serious handicappers who work hard to mention game specifics that show they're in that 'clear sight' mode. When you see a handicapper that is making high quality selections and is calling a game point-for-point, move-for-move? We've got the first step in identifying that streak. When someone is on that kind of trajectory, this is what we call being “on a bullet” in the professional statistics and analysis business. We look for many high quality plays, not just one. Several overlaying quality picks across multiple handicappers that then result in a majority of wins? Now we're on to something. So we're not following and matching picks with any one handicapper; we're quite literally taking the very best off the top of the high quality plays. We make our own streak without relying on anyone and it's perpetual. Remember earlier I stated that most handicappers of any ilk are really running at about a 50% success rate over long periods of time. Do they hit streaks? Absolutely, but they also lose in streaks. With our system we're hitting games at nearly 70%. We know you've heard those kinds of percentages before, and you know as well as anyone they're nonsense from any handicapper who makes the claim. Our situation is far and away different from any handicapping you've followed before. You really can't include our percentages in the same category as anyone or any company trying to handicap games. Not only is it unfair, it's apples to oranges. When it comes down to it winning is what matters but it's far from the whole story. This is far more than gathering and correlating data, or logging win/loss records across multiple handicappers. The system is far and away more complex than that alone. We're also going in depth with our analysis of what kind of selection quality is at work. As we've said, sometimes quality picks lose - but quality selections are the first sign of a potential streak. But as you'll see quality selections per handicapper don't last either. They fluctuate like any other parameter. This is a crucial factor in understanding our method: even the best handicapper you know about won't always put out a quality selection. People get behind in analyses, and because they have people expecting a pick - they slide one out they didn't put a lot of effort into. It's not only a factor in our formula, it's also a fact of life. This is why we read every selection, every analysis, and then track the myriad of wins and losses - but those wins and losses come with big caveats (only one being what the quality of selection was). Are there consistencies when it's all boiled down? You bet. At leftAbove are three handicappers monitored over a simultaneous 28 game span. As you'll note, the quality of the selections vary wildly across all three, as do the win/lose ratios. But in most cases when these handicappers fell into that 'clear sight' period and gave quality selections, they got the win. What we look for is that clear vision that equates to a winning streak, but we look for consistencies across multiple handicappers, as seen here. This is on a small scale example, when in reality we'd be monitoring hundreds of handicappers every day. You can see the complexity that exists just in this one aspect of our system viewing only three sources. Now imagine every handicapper, every selection, and quality ratings across them all...pretty soon you've got a monumental task just from this one corner of the field. This is why it's taken us so many years to develop not only the framework for data gathering and analysis, but also garnering the computing power to get the job done in every aspect of play. Look at our affordable packages Visit our online store. Above is a small sample size algorithm result, monitoring four of the bigger name handicapping services. As you can see, these four services register in the average mid-fifty percentile with short bursts of winning streaks. These momentary successes can be as high as the mid-eighties - but never last for very long. More often than not these are followed by a significant decline in positive results. Those sharp declines are what rob you of the profits garnered by the previous wins. Short-lived wins can be elating - but they're soon forgotten when you then go on a losing streak twice as long as the win. As you know all too well, services often brag on their wins while pushing their losses to the back of the presentation with barely a mention. 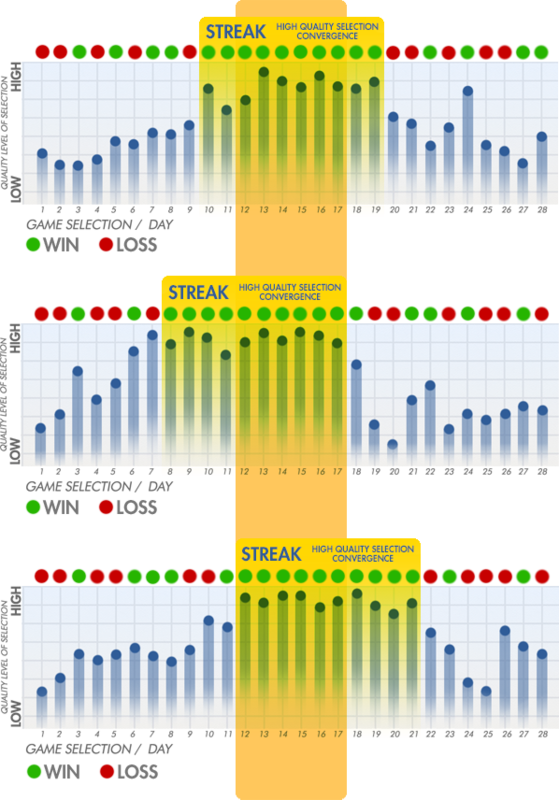 BlueStreakSports.com's results maintain a high average (around 70%) above all the selected samples, but more than that - is the consistency. Yes, we have higher average streaks like everyone else, but when you're not a slave to a single, or small pool informational outlet - you bounce to the next streak - no matter where it might be. This affords us a maintainable, high average of successful wagers. Note that some of the high win percentages seen in these services coincide with a spike in our own - because we follow every single service, and handicapper of note out there. Their streaks, are our streaks.